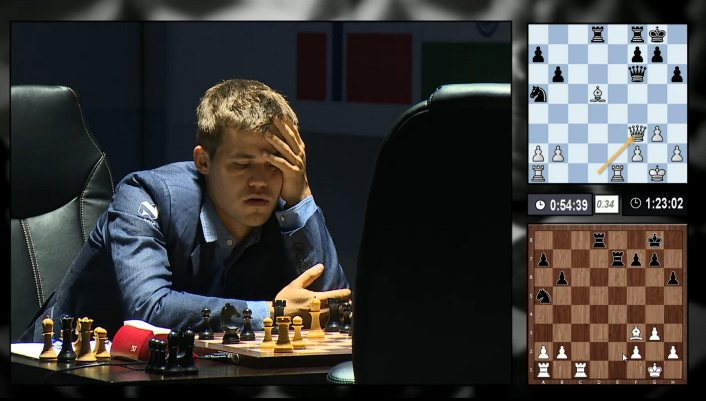 It’s tough to be a chess fan! In Game 5 of the 2014 World Chess Championship Magnus Carlsen delighted his supporters by playing a new opening much faster than Vishy Anand. Excitement turned to concern, however, as it grew obvious the Indian new exactly what he was doing, playing a pawn sacrifice to inject life into a seemingly dull position. A dramatic win for the challenger looked a real possibility, but then, almost before we had time to realise what was happening, the players had agreed a draw. IM Lawrence Trent tries to make sense of it all in his express video recap. I think in the match it’s a little bit different. I’m on 50% now. In a tournament that would be pretty bad, but in a match that’s ok. The situation is not too bad. I’m quite optimistic on the future of the match. It’s not going to be easy but again I guess since I’ve two white games now this is sort of the moment to pull ahead. You can of course watch Game 5 live here at chess24 at the same time tomorrow, Saturday 15 November!